a) If you install a 23” wheel, you must install our 1” lowering link (HMD-01)* for the rake kit to work safely. It was designed to work in conjunction. 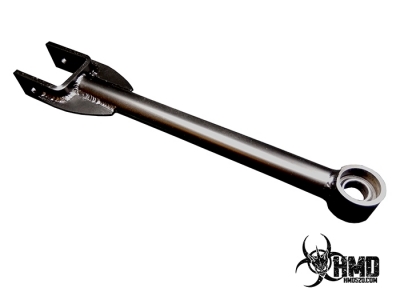 b) You can install our 2” lowering link (HMD-02)* which is a combo link, with this rake kit, or air ride. If you install a 26” wheel, you do not have to use a lowering link. 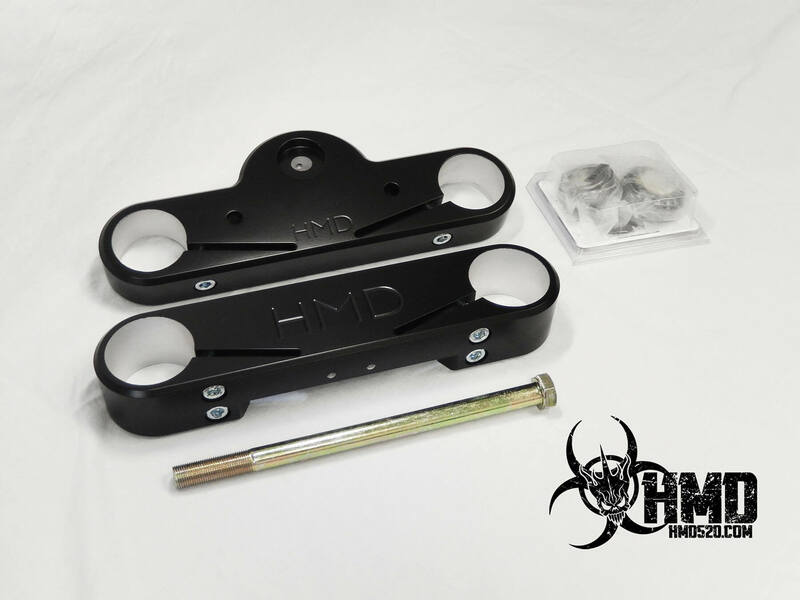 You can use our 2” or 3” lowering link (HMD-02)* with the 26” wheel OR air ride. In some cases, depending on the condition of the roads you ride on, we recommend that you also add our fork extensions (sold separately). The fork extensions will allow the rake kit to have the correct fender clearance for said road conditions. HMD will not be liable for damage due to fork extensions not being installed. 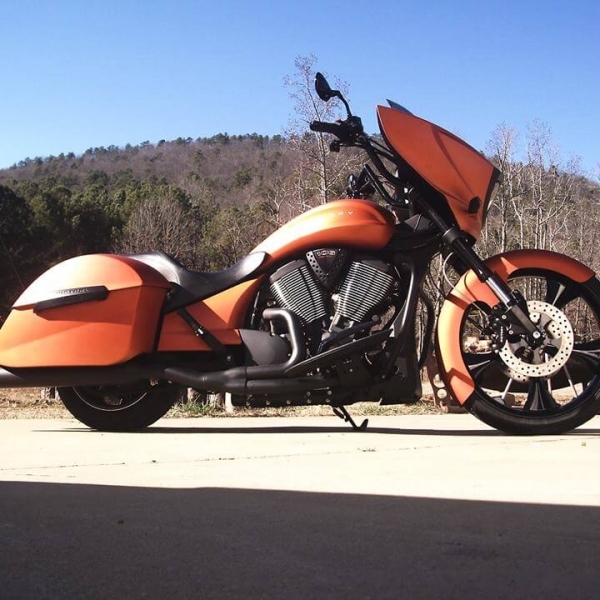 You can use this rake kit on a trike installation with a stock 18” wheel. 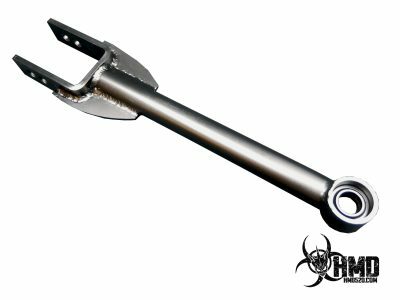 You must use our 1”loweing link (HMD-01)*, in order for the rake kit to work safely. 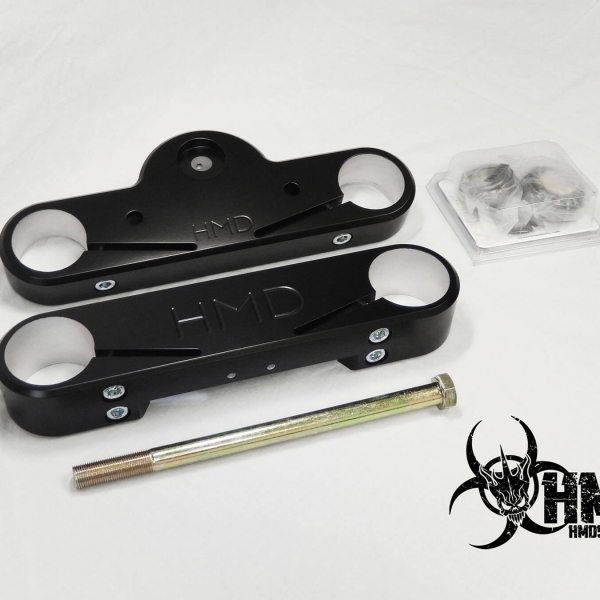 *If you have purchased, or plan to purchase a lowering link from another vendor, HMD520 (Heavy Metal Designz) is not liable for any injuries that occur as a result of our link not being used. THIS KIT IS NOT TO BE USED WITH A STOCK 18” WHEEL OR A 21” WHEEL IT WAS NOT DESIGNED TO WORK WITH THESE WHEELS. DOING SO WILL CAUSE SAFETY ISSUES. YOU MUST FOLLOW THESE PRECISE INSTRUCTIONS WHEN INSTALLING THIS KIT. 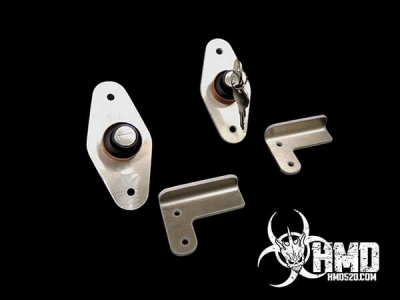 HMD520 (Heavy Metal Designz) is not liable for any injuries that occur as a result of this kit not being installed as directed. By purchasing this product, you are agreeing to these terms. Warning & Disclaimer: All parts sold are for OFF ROAD use only! To achieve Maximum Performance Safety and reliability, all parts must be installed and tuned by a Professional Victory Technician, and used on a closed course. We hold NO RESPONSIBILITY for the misuse or improper assembly, installation or usage of any performance related products that we sell. You must follow the guideline and installation sheet for optimum performance and safety. 1 You will need to use a scissor jack (or a jack) to lift the front of the bike. 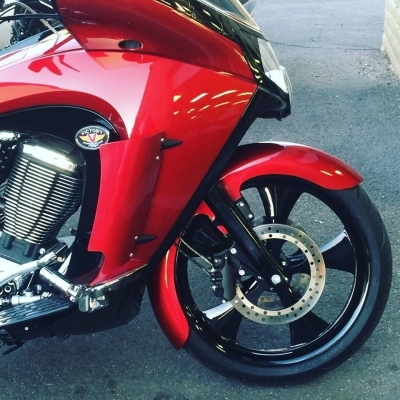 Once you have the front wheel off the ground you can proceed to remove the front end. 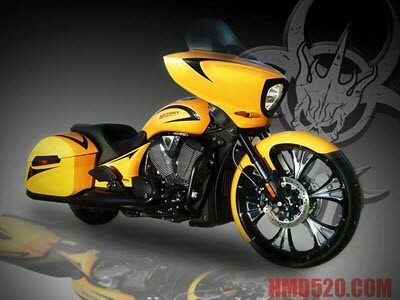 2 Remove outer fairing. You will need to remove head light ring in order to get to the screws that hold on the headlight. Once you have removed the screws unplug the head light bulbs. Remove the turn signal connector. You will also need to remove the speaker covers. There are two screws located behind them that connect the fairing. 3 Disconnect all wires from both harnesses. Once the wires have been disconnected, you can remove the 4 bolts that hold the aluminum frame onto the tree. 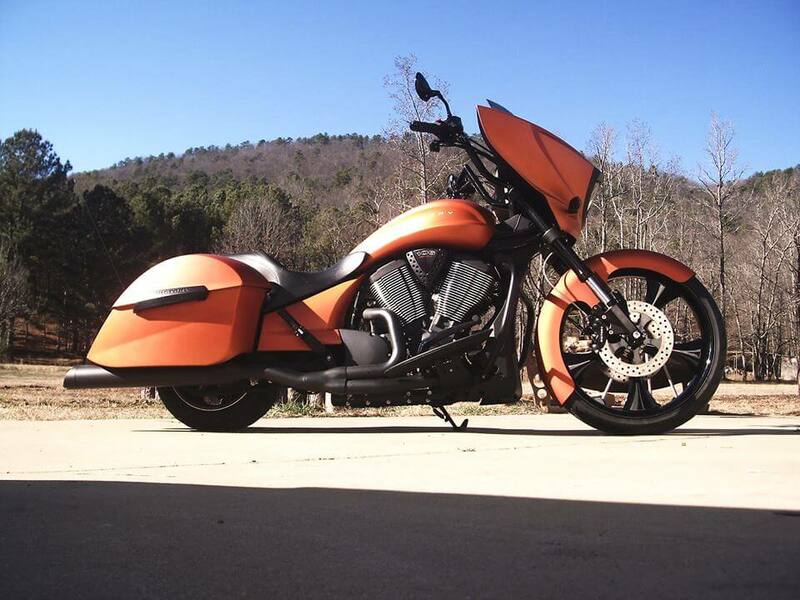 Now you can lift the entire inner and outer front fairing off the bike in one piece. 4 At this time I would recommend you cover your gas tank with a towel or blanket, so you do not scratch the paint. Remove both bolts that hold the handle bars on. You can let the bars rest on the tank. 6 Remove both brake calipers. Loosen the lock bolts on the axle. Remove the axle and wheel. 8 Loose top bolt on upper tree. Now remove the upper tree. Once you have this removed you can remove the spin lock nut by using a screw driver and a hammer. Slightly tap the lock nut counter clockwise. The tree will slide out the bottom. 9 Assemble top and bottom trees with provided bearings races, and seals, use a waterproof synthetic grease to pack the bearings. 10 Insert the 5/8 hardened stem bolt and flat washer through the top of top tree. Thread the bolt into the bottom tree assembly by hand until you are sure that the bolt is started straight. Tighten the stem bolt until there is no play in the trees. Now back the stem bolt off ½ turn. This allows easier assembly of the forks into the trees. 11 Insert the left and right forks into the trees. At this point, hand-tighten the top pinch to prevent the forks from slipping out. Leave bottom pinch bolts loose. 12 Now set the bearing preload of the trees, using a precision torque wrench tighten the stem bolt to 14ft/lb. NOTE: Over tightening the stem bolt will result in poor handling. IMPORTANT: Lock the stem bolt with the 6mm set screw. The set screw, threads into the top of the front tree. 13 Torque all pinch bolts to 35ft/lb. It is recommended you do not use any thread lubricant or locktite on any threads. NOTE:We recommend you re-check torq specs and proper preloading after riding 100 miles. It is extremely important to loosen the locking setscrew when making adjustments in bearing preload. When preload has been adjusted make certain to retighten the setscrew. 14 Assemble the rest of the front – end, handle bars, brakes, fender, and wheel. 15 Assemble the rest of the fairing components applicable to your installation. 16 It is recommended that tires be inflated to manufacturers maximum pressure, and maintain the tire pressure on a regular basis. Tour packs, leg lowers, improper tire pressure, and improper stance can result in improper handling. Not responsible for accidents. By purchasing this product, you are agreeing to these terms. Not responsible for accidents. By purchasing this product, I am agreeing to the terms of this product, listed in its description.